The triangular box series of jigsaw puzzles by Heye includes cartoon and finely detailed puzzles. This one is no exception. United Dragons of Europe has 4000 pieces and artwork by Marino Degano. 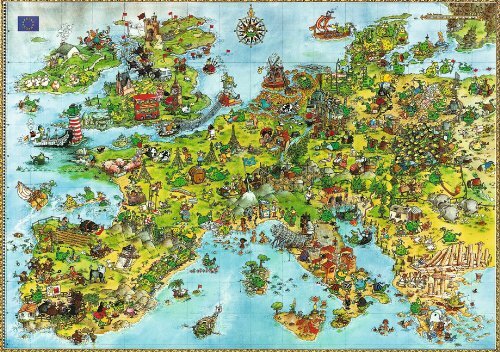 It features a comic style mope of Europe filled with dragons, people, animals and landmarks. The finished puzzle measures 96 x 136 cm. Made in Germany.